Some discs fly to the left, and others go right. 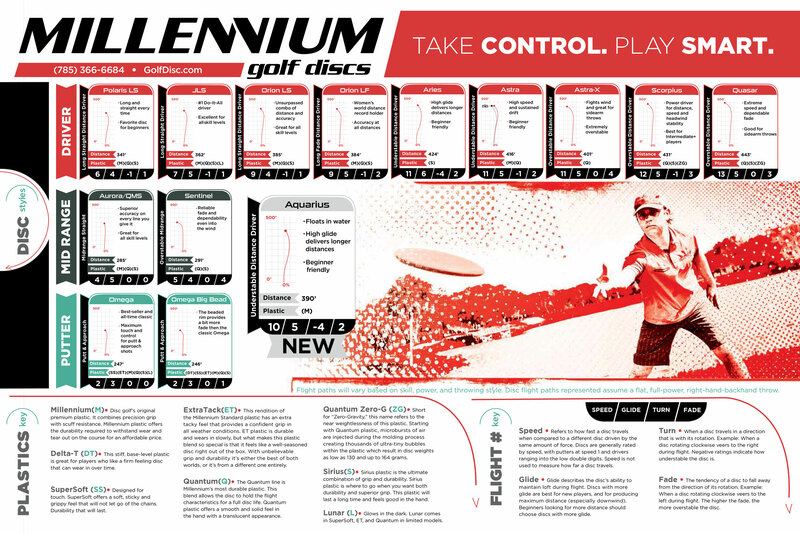 Like clubs in ball golf, discs are designed to travel on a variety of flight paths to meet any challenge on thecourse. The way a disc's flight characteristics are defined is through the term Stability. Let's assume you are a right handed player using a backhand throwing motion (RHBH). If you throw a disc on a straight, flat line using average power and it continues to fly straight, that disc is considered to be Stable, and would be given a stability rating of (0.0). Now you choose another disc and this one fades to the right. We call that disc Understable, and would give it a negative stability rating of (-1) for a gentle turn, and (-3) for a more severe turn. When it comes to drivers, understable discs are easiest for new players to control. When thrown flat, straight and with enough power, understable discs tend to turn in the direction of their spin during the initial stages of the flight. (All spinning discs tend to fall opposite their spin at the end of their flight as they lose speed.) Assuming you are still using that RHBH throw, your disc would spin right and turn right. It's just the opposite for lefties. Understable discs tend to turn in the direction of their spin in proportion to the speed of release. A fast released disc goes into the direction of its spin longer and further before it eventually falls off to left as it loses speed at the tail end of its flight. A slowly released disc will not see much movement in the direction of the spin and will fly straight and fall off opposite the spin direction as it loses speed. Understable discs are the easiest for new players to control, and will provide the most distance for beginning disc golfers. They are great for beginners but used by pros and experienced players for various shots specialty shots. Understable discs should not be used in a headwind as they are too unpredictable. As mentioned above, most golf discs, especially drivers, tend to fade to the left, which would put them somewhere within the Overstable range. This is the more natural flight path for sharp edged discs. These discs get a positive rating of 1 (moderately overstable for a subtle fade), to 3 (extremely overstable for a hard turn). Overstable discs tend to turn away from the direction of the spin of the disc. In the examples above, the spin on the disc is clockwise (to the right), so an overstable disc fades left. The chart will need to be reversed whenever the spin on the disc is reversed. For example, a left handed player using a backhand throw (LHBH) (counter clockwise spin) will see an overstable disc fade right, not left. The same goes for a right handed player using a forehand throw (RHFH), and so on.